One thing that is undeniably “British” is the love of a good underdog story and British military history is filled with examples of just that. The Harrier in the Falklands. The Swordfish bomber attack on Taranto harbor. The evacuation of Dunkirk. That’s to name but a few. In 1991 on the eve of the ground war to liberate Kuwait and destroy Iraq’s mighty army one of the underdogs was certainly the British Challenger tank. 221 Challenger tanks were eventually deployed to Saudia Arabia to liberate Kuwait and operated under the guise of the 1st (UK) Armoured Division supporting the US Army’s VII Corps. As the tanks deployed there were worried muffles in the Ministry of Defence and amongst military analysts about how well they would perform especially in the face of Iraqi armored forces who were superior in number and had extensive tank vs tank combat experience following the Iran-Iraq War. The reason for this is that the Challenger had developed quite an unenviable reputation at the start of the 1990s. In service, it had displayed very poor reliability and this was the source of much frustration amongst crews and commanders. Even worse, however, was the stigma of having finished last in the prestigious Canadian Army Trophy tank competition held in West Germany in 1987 against tanks and crews from all over NATO. Despite the MoD highlighting several key factors for this poor performance, the stigma remained and so when the Challenger deployed to the Gulf it had a lot to prove. Prove itself it did. During the course of the 100-hour ground war the Challenger had completely reversed its reliability problems and achieved an enviable serviceability record; a testament to the hard work and dedication of the support crews who keep these vehicles going. In combat, it was the superior of anything it came up against and by the end of the three-day, offensive Challengers accounted for some 200 Iraqi tanks destroyed or captured along with numerous armored and ‘soft’ vehicles. During the offensive one, Challenger finally laid to rest the doubts anyone had over the capability of the type with a single shot. That shot was made over a staggering range of 5,100m (3 miles) with a Depleted Uranium (DU) round – the longest confirmed tank kill in history! Two Americans, a special operations soldier and an explosive ordnance disposal specialist on his first overseas deployment, were killed by enemy fire in Afghanistan on Friday amid volatile U.S.-Taliban peace talks and an alienated Afghan government. Sergeant First Class William D. Lindsay, 34, from Cortez, Colorado, and Specialist Joseph “Joey” P. Collette, 29, from Lancaster, Ohio, were killed by small-arms fire during a joint operation between U.S. Army Green Berets and Afghan special forces soldiers in northern Kunduz Province. Four Afghan commandos were also killed, according to The New York Times. Another special forces soldier, U.S. Army Staff Sergeant Chris, whose last name is being withheld, was wounded during the firefight. He is listed in stable condition and was able to notify his family personally of his injury. Chris will be evacuated to Landstuhl Regional Medical Center in Germany for follow-on treatment, Newsweek reported on Friday afternoon. Two additional U.S. service members were also wounded from the same incident. We will not publish their names at this time, but both soldiers are expected to recover after being medically evacuated to Landstuhl Regional Medical Center in Germany and then on to Walter Reed National Military Medical Center in Maryland. U.S. Army special forces teams, known as Operational Detachment Alphas, set out on a joint mission with soldiers from the Afghan National Army Commando Corps, the special forces arm of the regular army to raid a residential area in search of a high-value individual within the Gul Tepa District of Kunduz. 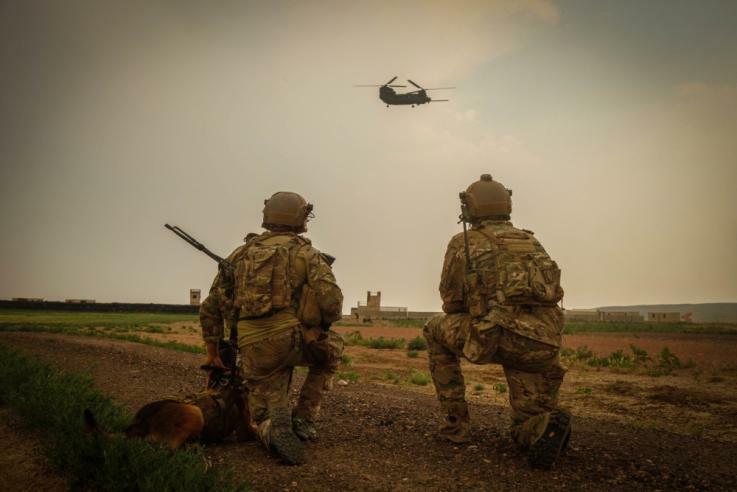 Combat raids are typical missions for both American and Afghan troops as negotiations continue to draw the war to a close, said two Defense Department sources who asked not to be named due to Pentagon media regulations. Unlike the rural, tribal regions of Afghanistan’s southern Helmand Province, Kunduz is a bustling urban city, the sixth largest in Afghanistan with a population of more than 268,000, according to a 2015 United Nations reports. Intelligence suggested Taliban fighters were not supposed to be in the area when the gun battle broke out, and because the special forces soldiers were in a residential area, no air support was provided, said the sources. The U.S. military sources said they believe the Taliban was tipped off and had set up an ambush for the American and Afghan forces. The elite Special Boat Service (SBS) troops, whose presence in the war-ravaged country is shrouded in secrecy, suffered gunshot injuries in fierce clashes with Iranian-backed rebel militia in recent months. The SBS men were treated for leg and arm wounds following the battles in the Sa’dah area of northern Yemen, where up to 30 crack British troops are based. The casualties are understood to be now recovering in the UK. The revelation that British forces are fighting in Yemen sparked angry criticism last night because the conflict, which has seen Saudi Arabia and Iran support opposing sides in a four-year civil war, has triggered the world’s biggest humanitarian crisis. Aid agencies have pleaded for a ceasefire to be negotiated to enable charities to help eight million Yemenis facing starvation and two million rendered homeless. An estimated 10,000 people have been killed in the fighting. 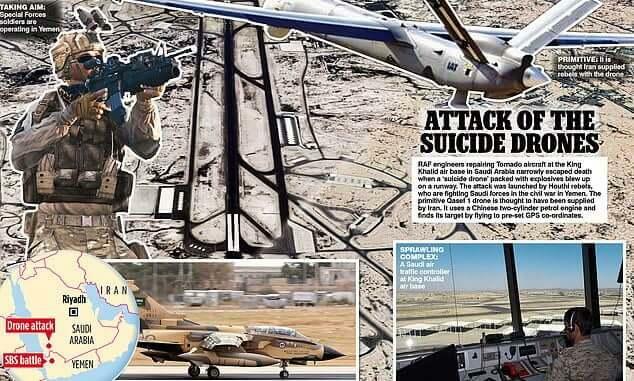 The Mail on Sunday can also reveal how RAF engineers sent to Saudi Arabia to repair the kingdom’s fleet of military aircraft narrowly escaped death last week. Iranian-backed rebels launched a ‘suicide drone’ strike on the King Khalid airbase, where they are maintaining Tornado jets used to bomb civilian areas in Yemen. According to reports, the drone exploded on the runway, destroying two Tornados. 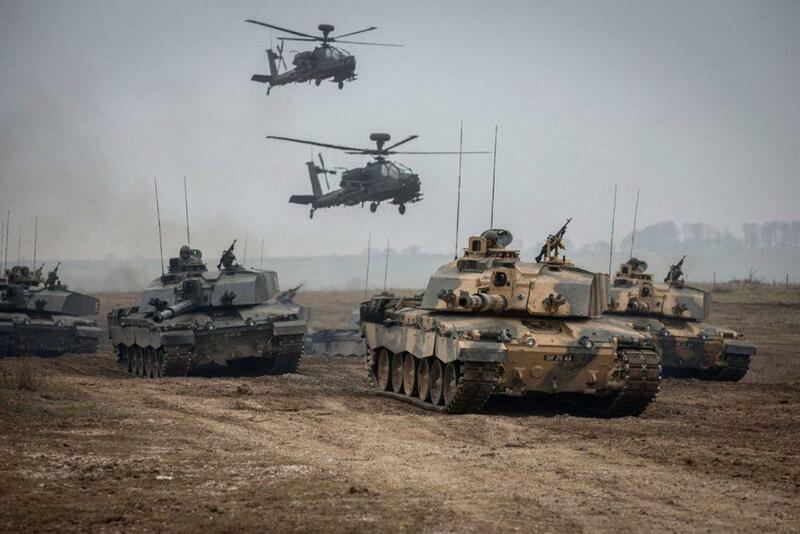 The MoD said no UK personnel were wounded. An SBS source said: ‘The guys are fighting in an inhospitable desert and mountainous terrain against highly committed and well-equipped Houthi rebels. The SBS’s role is mainly training and mentoring but on occasions, they have found themselves in firefights and some British troops have been shot. The SBS mentoring teams inside Yemen include medics, translators and Forward Air Controllers (FACs), whose job is to request air support from the Saudis. The 200-strong SBS, which is based at Poole in Dorset, is a maritime Special Forces unit and was founded in 1940. It recruits mainly from the Royal Marines. SBS personnel served with distinction in Iraq and Afghanistan and most recently in operations against Islamic State in Syria.